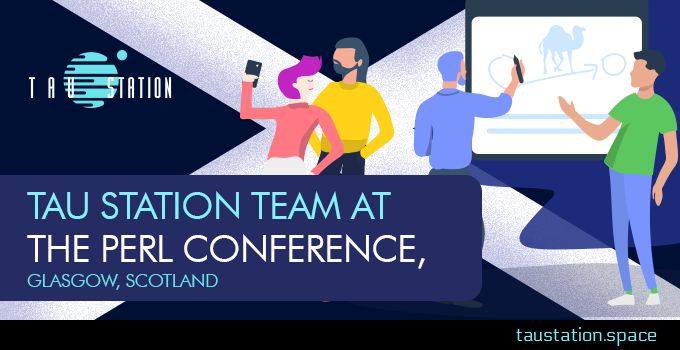 For the week of August 13 through August 17, 2018, part of Tau Station’s backend development team will be in lovely Glasgow, Scotland, attending The Perl Conference – Glasgow. There are major Perl events held worldwide every month and this is one of our favorites. Curtis “Ovid” Poe, the “captain” of Tau Station, will be giving the closing keynote speech, The Future of Perl 5 and Perl 6. Ilya Chesnokov, one of our backend engineers, will be giving a talk called Lua by the eyes of a Perl developer. Amongst other things, Ilya helps to oversee code quality, makes sure we don’t skimp on testing, and builds our payment systems and forum features. Yaroslav Polyakov, the man who’s written our massive mission builder and helps the narrative designers whenever they have questions has just moved to a new town in Germany, so sadly, the conference timing isn’t great for him. Peter Mottram, who handles chat systems, large game campaigns, and general fire-fighting, will also be there. He’ll be dragging us along to various pubs, explaining in fine detail everything we never knew about the finer points of adult beverages. Rinchen Emma Ridley, who oversees the front-end team and ensures we meet Web accessibility guidelines won’t be attending the conference, but she’ll be meeting up with the team for dinner. Given that we all work remotely, it’s going to be great to see each other in real life! Unfortunately, while we’re going to be having a blast in Scotland, Florin Mesaros, backend engineer who is building syndicates and knows our trade system like the back of his hand, managed to use up his vacation time and will be quietly crying at his home in Romania while the rest of us play. Glade Kettle is another front-end developer living in Australia. He handles the front-end side of chat and also reminding us about Web accessibility standards. He’s already on holiday and probably having more fun than we will at a Perl conference. This is a long-winded way of saying “there will be no game update that week.” With many key developers abroad, we don’t want to risk pushing a release and having things break while we’re drinking beer in a foreign country. That wouldn’t be good for anyone and certainly wouldn’t be fun for us.